I configured a multibranch pipeline job to discover and build branches and tags for my git repository hosted in Bitbucket Server. New branches and commits are discovered and built correctly but new tags remain undiscovered. 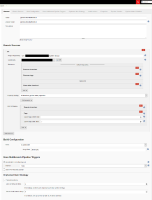 I can force tag discovery if I initiate a manual scan in Jenkins or I click "Trigger Jenkins" in the Webhook to Jenkins for Bitbucket Server UI for my repository. Originally, I wanted to use the Bitbucket Branch Source Plugin rather than the Git Plugin but in that case JENKINS-51063 prevents tag discovery and build. Is there a similar issue with the Git Plugin? I believe this is already available if you install the Basic Branch Build Strategies Plugin as described in a jenkins.io blog post and in "Notes from the Lifeboat"
Mark Waite added a comment - 2018-09-12 15:47 - edited I believe this is already available if you install the Basic Branch Build Strategies Plugin as described in a jenkins.io blog post and in " Notes from the Lifeboat "
I have the Basic Branch Build Strategies Plugin installed, and set it to discover tags, but it tags remain undiscovered. The mentioned post is using the Git*hub* Plugin, not the Git plugin. I have a support request out to Mohami (creators of the Webhook to Jenkins for Bitbucket Server) and they indicated it is an issue in the Git Plugin. I'm not familiar enough with the plugin to make this assessment however. Ryan Taylor added a comment - 2018-09-12 16:00 I have the Basic Branch Build Strategies Plugin installed, and set it to discover tags, but it tags remain undiscovered. The mentioned post is using the Git*hub* Plugin, not the Git plugin. I have a support request out to Mohami (creators of the Webhook to Jenkins for Bitbucket Server) and they indicated it is an issue in the Git Plugin. I looked through git plugin source and unfortunately it has same issue [as JENKINS-51063] https://github.com/jenkinsci/git-plugin/blob/master/src/main/java/jenkins/plugins/git/GitSCMSource.java#L628 it incorrectly creates instance GitBranchSCMHead for tags when fires SCMHeadEvent (this is event is used by MultiBranch pipelines to trigger jobs - Freestyle jobs have another invocation procedure) . So I don't think it's possible to trigger new tags this way I'm not familiar enough with the plugin to make this assessment however. Refer to JENKINS-47496 for more details on building tags with multibranch. Mark Waite added a comment - 2018-09-12 16:09 Refer to JENKINS-47496 for more details on building tags with multibranch. With the latest set of updates, multibranch is discovering all branches like it should, but skipping all builds not manually triggered. Critical issue. John Mellor added a comment - 2018-11-26 14:12 With the latest set of updates, multibranch is discovering all branches like it should, but skipping all builds not manually triggered. Critical issue. If the only mention of a critical issue is in a comment on another bug report, it is much less likely to receive attention. Mark Waite added a comment - 2018-11-26 15:56 John Mellor you should probably open a separate bug report that describes how to duplicate the problem you mentioned as: With the latest set of updates, multibranch is discovering all branches like it should, but skipping all builds not manually triggered. Critical issue. If the only mention of a critical issue is in a comment on another bug report, it is much less likely to receive attention.